This polished 14k yellow gold Posh Mommy loop pendant is 31mm in diameter [the size of a half dollar]. 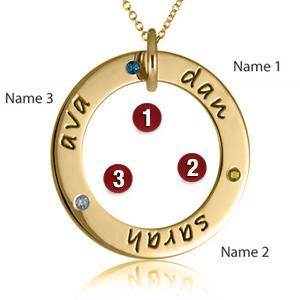 Engrave three names and select corresponding genuine birthstones. Each birth stone is 2.0mm in diameter and gypsy set. Engrave up to eight characters in each area. Chain not included.